Do you ever have that gnawing feeling that something is unsettled in your life but you’re just not sure how to address it? Perhaps you tell yourself you just need to get back to the normal Fall schedule, and the feeling will go away. The feeling may go away or lessen for a period of time, but somehow, it always seems to return. Instead of trying to suppress or busy yourself into not feeling, how about recognizing your body is talking to you and telling you an opportunity is present…a change is needed! I specialized in change management in the corporate world and became very familiar with the resistance that accompanies change. Even when there is awareness that change is needed, resistance will still arise. People prefer to intellectualize the resistance that comes with change. They talk about it and rationalize it, but they avoid dealing with the feeling itself. This is because real change creates real discomfort. On the whole, humans are creatures of habit…primarily, because there is a feeling of safety that comes with the familiar. Even when the familiar no longer works, we like to stay with it because our brains have associated it with a degree of safety. It helps keep the fight, flight, freeze brain in check. It helps ward off the feelings that accompany change like depression, grief, anger, and fear. DESIRING A CHANGE WEBINAR SERIES? If there is a change you’re wanting to make but feel stuck or uncertain of how to do it, this webinar series will help! Instead of trying to suppress or busy yourself into not feeling, how about recognizing your body is talking to you and telling you an opportunity is present…a change is needed! Become more proactive in attaining your goals. Effectively manage stress during the change process. Why awareness is the key to true change. The reason most changes you make don’t last. A self-awareness exercise to introduce you to the four levels of awareness necessary for true change to begin. Have you ever said to yourself...? It could be a workout schedule, a new diet, a job search, a change in attitude or better money management only to find you start out with great intention and find you slide back into the same old habits and behaviors. This is quite normal for humans, but it doesn’t have to be the norm. 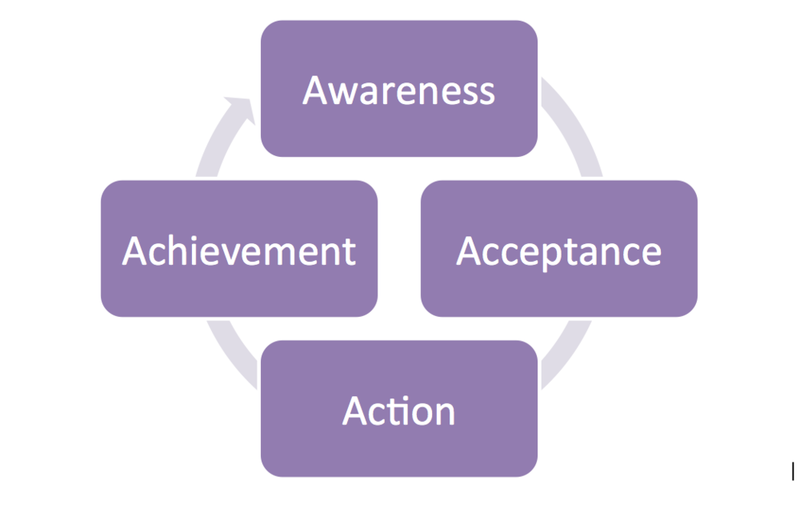 What is acceptance and why is it necessary for true change and goal attainment. How resistance creates suffering and acceptance creates power. Discover where your resistance lies and practice acceptance. Do you encounter the little devil on your shoulder whispering negative insults in your ear about yourself and others? Have you ever wondered how to shut him up?! You might have tried telling yourself to just think positive only to find that his negative commentary always seems to return! In the first webinar you learned the importance of self-awareness and how identifying blind spots is critical to making sustainable change. Learning how to accept the parts of yourself you don’t like so much. Remember you can’t change what you don’t take responsibility for. Discover the four levels of action. Identify what level or levels are holding you back from taking action. Plan action behaviors to improve goal attainment. So have you tamed the little devil on your shoulder that’s blocking you from making changes? You’ve learned how self-awareness and self-acceptance are key components of change and are necessary in order to manage that little devil when he/she speaks up. This next webinar speaks to the action part of my Conscious Change Model. Action is often considered the hardest part of creating a change. We often feel safer just imagining and thinking about the changes we want to make than actually doing the work of creating the change. The steps of creating better self-awareness and self-acceptance are necessary because they help you free up the energy that has been blocked. That energy we are now going to channel into taking action. Why acknowledging achievements is critical to goal attainment. Ways to increase self-acknowledgement practices.